How do I download my RCU Online Banking account information into QuickBooks? Log in to RCU Online Banking and on the Account Summary tab, click on 'Options' on the left hand side of the page. 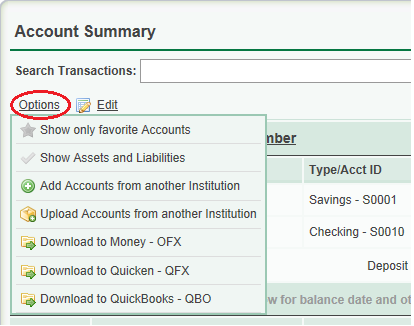 Select 'Download to Money - OFX', 'Download to Quicken - QFX', or 'Download to QuickBooks - QBO'. Enter the start and end dates and select the account you wish to download transactions, then click 'Download'. How do I download my RCU Online Banking account information into MS Money?